Following Hurricane Katrina, some New Orleans folk and EPA staffers have taken to calling the flooded part of town 'Lake George'. Grover meets with government bigshots every Wednesday morning to plan ever more budget sops to rich patrons and starving of funds to every part of government. Setting up a screwup this big takes more than a few years, and Grover doesn't just have a finger in this pie, he's been trying to bake it all his life. 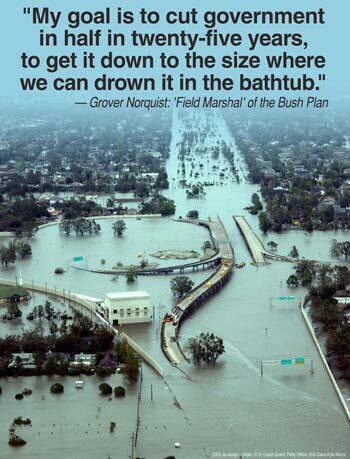 'Lake Norquist' would even share the same beginning as 'Lake N'Orleans', which is probably what the media will call it. But then again, outside the politically obsessive, just about nobody knows the name Norquist at all, no matter how deserving of this blame. So the Divinely Chosen Guitar-Strumming President will probably win out. The fish rots from the head, etc. Besides, he's such a Strong Leader that he must surely agree that the buck stops with him. (Joke.) And he has had five years to put his own stamp on FEMA (not to mention DHS). But if it's going to be His lake, I'd rather skip the ambiguous "George" and go with the very clear 'Lake Dubya'.